It’s fun to watch all of the gadgets on 24. 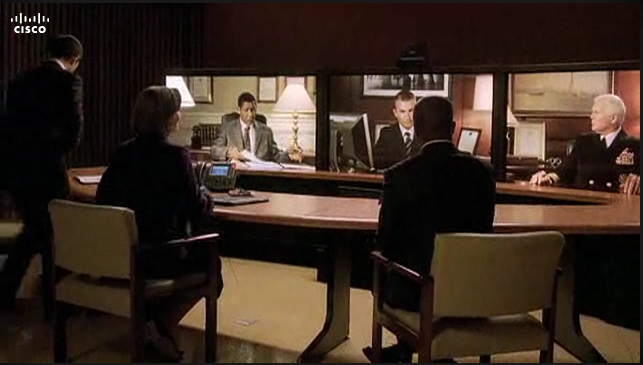 On tonight’s episode there was a scene that featured a video conference with three large flat-screen TV’s. This is an actual product called Cisco TelePresence. Any guesses on how much Cisco paid Fox for this product placement? Watch the clip here. By now, just about everyone who is interested in Web 2.0 has seen the The Machine is Us/ing Us video. Here’s a video of the creator of that video (Michael Wesch, PhD, is Assistant Professor of Cultural Anthropology at Kansas State University) speaking at the recent Web 2.0 conference. He breaks down each part of the video, explaining what he was trying to accomplish and how he went about producing it. The video cuts off part-way through his talk. I will post a link to the complete presentation if and when I find it. Some good ideas here. I like the idea of using Twitter for team communication at work. Another huge win for the Warriors. We Believe!